The first load is ready to go and as you can see, kitty is making sure he's coming along! We're set to start our move! That's what we'll be up to the next few weeks! I'll pop in occasionally with updates. I hope all of you enjoy your New Year holiday! I hope it is a safe, but merry New Year's for all! Several weeks ago I finished this peacock painting...I couldn't share it with you earlier because it was a Christmas gift to my daughter. Some time ago she asked me to do a peacock painting for her new apartment. This is not the sort of thing I've painted before, but let me tell you, it won't be the last. I did some research on peacocks and found that the peacock is rich in symbolism across various cultures and religions. In India, the peacock is the national bird and revered for its beauty and grace. In Buddhism, the peacock represents purity and wisdom. In Christianity, the peacock is a symbol of immortality. Since peacocks are faithful to their partners, they are often seen as symbols of eternal love. As I did my research, I thought about my painting's composition, color scheme ... Once I had made a few small sketches, I was ready to work on my canvas. I already had a 24x24 canvas with the background painted the color I wanted. I sketched the outline of my peacock on the painted canvas with a white chalk pencil and then applied molding paste to create texture. I love working with molding paste...it adds such depth and energy to a painting. You can see that I added this texture to the neck of the peacock, as well as it's wing and then the feathers that will surround the peacock. I also enjoyed working in the jewel-tone palette of blues, teal, gold and a bit purple. These are my colors! I'm surprised I didn't paint peacocks sooner! The whole painting came together quite quickly and smoothly. Since this piece was created for my daughter, I have already started a new piece--similar in composition, but a bit larger-30x30. It will be for sale when completed. All the research had me thinking about peacocks, their symbolism and I think there will be other peacock paintings in the near future. Here's my little Christmas tree this year! My 14-year-old kitty kept eating the fake plastic needle of my big tree (and subsequently, throwing up) that after a week I decided I was done and put it away! I pulled out my tabletop tree with lights, decorated it with a few handmade bulbs and a little bird that my friend made...and that was it! Did you all survive the holidays? Honestly, I'm a little relieved that the holidays are coming to a close. I'm ready to move on to my next BIG project: MOVING! We will have the keys to our new space in just a week. It's a little different move in the fact that we are moving withIN the building, just five floors down. Still, I am working at going through belongings, tossing things that do not need to go with us. And my mind is preoccupied with thoughts of how we will organize our new space. All of which makes it hard to focus on painting. But to keep my anxiety from making my stomach completely topsy-turvy, I worked in the studio for a few hours this afternoon. I am still trying to finish some pieces and have my eye on a few opportunities to show my work...and of course, the deadlines for those are mid-January (just when we're wrapping up the move). Life is a constant juggling act, filled with decisions on what you can and can't do...what you hold onto and what you let go...seldom easy it seems. But always an adventure. It's finally time...time to turn off the worry about whether it's "enough", time to stop doing and just enjoy being...being with friends and family that you hold dear. ...not out of the Tilsner, but just 5 floors down (directly below) to a first floor unit. I've been keeping this news mostly to myself for the past several weeks...not wanting to jinx it while we weighed the pros and cons and then waited to get our transfer request approved. So today we got the call and I am busting at the seams, anxious to share with you the news that we are on the move in just a few short weeks! This really wasn't a move we were looking to make...I love the coziness of our current space with it's view of the river! I have told my hubby on numerous occasions that I was happy staying put. But about three weeks ago, he was walking past the empty first floor unit and convinced me to take a look. My hubby knows me well and knew that when I walked in I would be taken with the expansive space, high ceilings, large brick wall and those incredible floor to ceiling windows. We walked through and started to think about the possibilities of this space. Mixed in with the positives, there were some negatives to moving and losing our current space. So we made two visits to look at the new space and have had many discussions weighing the pros and cons. While the space is larger, it also comes with higher rent...which will force us to give up our outside studio space at the Jax (ultimately by moving everything into one large space we will cut our expenses). I love my Jax space, but having a studio space at home will have its advantages too. And my studio space in the new apartment will be the room just to the left of the open space (see top photo)...it also has floor to ceiling windows--perfect for painting! The only down side to those windows is that they look out on a busy street. There will be more traffic noise and no view of the river. But we will have a lofted bedroom towards the back of the apartment. Outside of the windows and studio space, this was the biggest factor in deciding to take the space...it will give us much more privacy than we have in our current space. In the end, we decided the positives outweighed the negatives...and decided to go for the change. Once we saw the space we simply could not stop thinking about how this space would work. We've already been dreaming of trips to Ikea and planning how to use the new space. So we will wrap up 2010 in Studio 507, but kick off 2011 with a move to Studio 107. I wrote my work plan at the computer with my kitty looking on. My first assignment for the WARM Mentor program was to write a work plan. Basically, it is an outline of the work I plan to do in the two years of the program. It spells out my goals, what steps I plan to take to reach those goals... Things will change no doubt, but this work plan will provide the framework as I begin the program. Each protegee had to meet with their new mentor and review their plan. The work plan needed to be turned in December 8th. It was a challenging task. There is something about speaking our dreams out loud that is very powerful. It becomes even more powerful when you make a step by step guide for how you plan to achieve those dreams. It makes it more real. I'll admit that I was initially a little vague on a few points. And there were some dreams that I wasn't quite ready to put down on paper. But then I met with Brenna and it all came tumbling out...the dream of showing my work at outside venues and even having a solo show. There are a lot of steps from here to there, including writing an artist statement and resume...but I feel I am headed in the right direction. I have also started meeting with two of the other protegees. All three of us will be working with Brenna (as our mentor). It has been fun and energizing to meet with other artists who are at the same place I am. Over the next two years the three of us plan to meet as a small group...throwing out support to one another while also challenging each other! I feel like my life will be filled with much change over the next few years...I'm not sure how some things will shake out, but I feel that by participating in the WARM program I am taking some very positive steps in my art career. I am open to all the possibilities. No doubt there are times when I wish I had a little crystal ball and could see into the future...but what fun would there be in that? Several weeks ago I wrote here with excitement about learning who my WARM mentor would be these next two years. I wanted to share with you then who the artist is, but I also felt I should wait to share her name until I cleared it with her. Well, weeks have past and I have met with her and now I can share my great fortune! 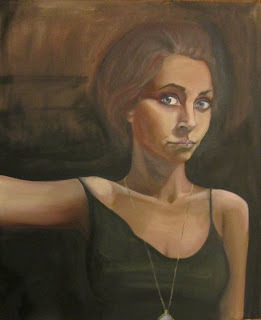 I will be working with mixed media figure artist Brenna Busse. I have admired her work for several years. 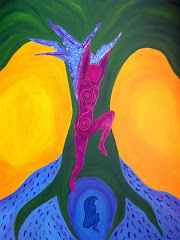 I am sharing pics of one of her pieces that I bought as a birthday present for my dear friend Julie. You can check out more images of her work at her website or if you're in the area, the Grand Hand Gallery carries her work. "My intention is to communicate and inspire. Using materials as metaphor; I share my celebration of the beauty of nature, faith in possibility and the sacred quality of daily life…"
During Julie's visit, we were able to visit Brenna during her recent show at Ramsey. I will start the mentor program, with Brenna as my guide, in January. I have met with her just twice--first, for the interview and then most recently, we met to review my work plan. Each time that we have met I leave energized and with a clearer vision of what it is I want to work on. Brenna asks good questions and perhaps even more importantly, she is a good listener. I am sure I will learn much and grow even more. Next up: my work plan! It's been a hellava weekend, weather-wise. 17 inches (more or less) of snow dumped on us in less than a 24-hour period, starting late Friday night. It was a true blizzard, with snow falling and a wicked wind swirling the snow all around. For most of Saturday, visibility was so poor that we couldn't even see the river. This is the biggest storm that Mpls/St. Paul has seen since 1991 (the Halloween Blizzard). City buses suspended service and even the plows were pulled off the road for a bit. I was happy to be safe at home. And even happier that my kids were safe in their homes as well. The picture below was taken Saturday when visibility was actually improving. Do you see that one lone car parked on the upper level of the lot across the street from us? That lot did get plowed and that car just left the lot! We already have 2/3 the average amount of snowfall for a season. I don't think we're going to be "average" this winter. But we've been on the low end for a few winters now, so I guess we're "due". Sometimes there's just no place to put the snow...a problem I think we'll be dealing with quite a bit this winter. At least today the sun was shining...and that always helps! My studio was warm and cozy and I had a lovely time painting. I so want to show pictures, but I was working on a painting for my daughter's holiday present. I think she'll like it! Hope all of you are warm and safe this winter night! It's a Friday night and here in Minnesota we are preparing to get hit with a blizzard! Aw shucks, guess I'll be stuck in the studio this weekend! Tonight I am a "theatre widow"... hubby is off starring in a holiday dinner production of Ole and Lena. I'm not complaining...just enjoying a quiet evening catching up on editing photos and then doing a little blog-hopping. The past week has been a wonderful week of celebrating the 50th! Julie was here till Tuesday evening and we packed in lots of visiting and different activities. And when you're best friend is also an artist, that means lots of artsy fun! We went to several small galleries, a bead store, the Mpls Institute of Arts (MIA), and the Swedish Institute! In between all that, we had great meals at places all over town! I wanted to take a nap in this chair at the MIA, but it had a clever sign that read "Keep your paws off". It was part of an exhibit on the art of chairs. At the Art Institute we went to the featured exhibition titled Art of the Native Americans: the Thaw Collection. While general admission to the MIA is free, there was an exhibition fee to view this collection--well worth it (plus I got discounted tickets!). This show is up till January 9th--go check it out if you're local. This Sunday, December 12th there is a special family event focused on Native American art. I love that there is so much to do in this town that is art-related! Wednesday night I wrapped up birthday celebrations with a dinner with former co-workers...including two others celebrating birthdays this week. It was fun seeing old friends. But now I'm settling back into my studio routine...and hard at work on a few new paintings. I can't show you pics because they will be holiday gifts! 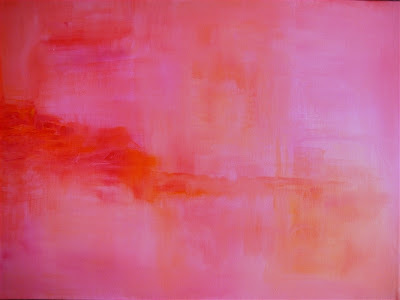 I can share that I sold the above painting, Sunrise, to the boyfriend of a former co-worker, Erin. Erin was with her boyfriend when they saw my work at Trotter's late this summer. He contacted me to buy one of the paintings that she had admired! What a great guy! (I can tell this story because he already gave her the painting!) I love sending my paintings off to homes where I know they will be enjoyed! Today is my 50th birthday! I'm still trying to figure out where all the years went! Some are best left behind! But over the years, many wonderful memories have been created alongside family and friends. And that's just how I plan to spend my day...alongside the folks who hold a special place in my heart. And since it's my birthday, I thought I'd share some pics from my "younger years" ! 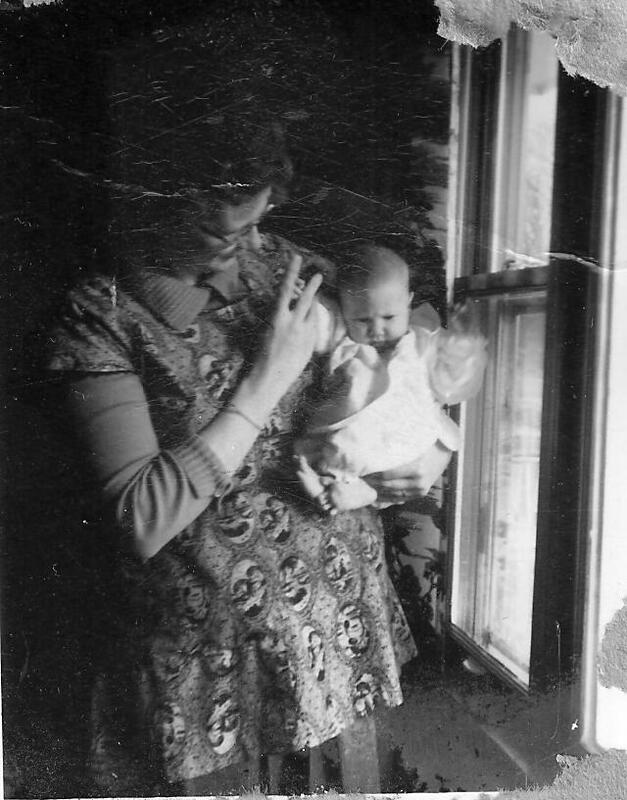 The top photo is one of the few (perhaps only) photo I have of myself as a baby being held by my mom. 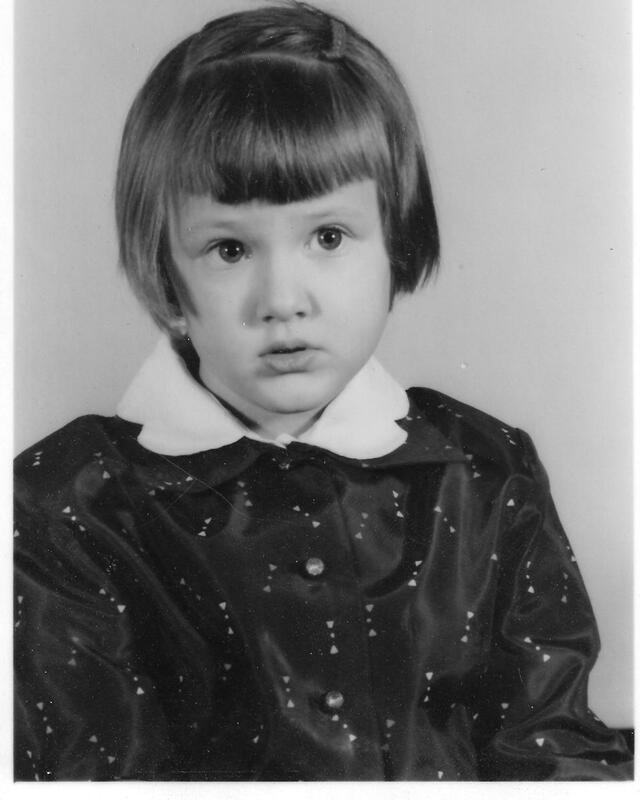 Let me say first--I do have baby photos, mostly portraits taken at a photo studio. Plus many of our family photos from that time are still only in slide format (something I need to change). But actual photos of me with my mom...this is the one I can actually hold in my hands. I scanned it here--the original is a little beat up, plus it's quite small. But I treasure it nonetheless. 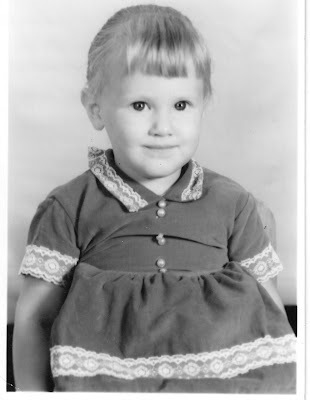 Here I am at 18 months, I think. My hair is straight, pulled back in a ponytail. I have bangs! I would love to have bangs now! And by the way, I have my older sister, Diane, to thank for my name...which I love! Originally I was intended to be named Rose or Rosemary after my mom's aunt ... I guess Rose would have been fine, but I much prefer Risa! It took me until college to learn that my name means laughter, which suits me just fine. Here I am in the backyard of my childhood home with my younger sister, Nan, and the two dogs we owned at the time. I'm the one in the back with my brother's dog. 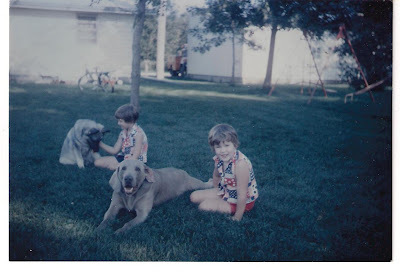 The weimaraner in front was named Doc and was our family dog for years...I still would love to own a dog like him someday. And that backyard...was huge. I grew up (till the age of 12) in the small Minnesota town of Ellsworth...it was a great place to be a kid. I love looking through old photos (I am a sentimental fool) and have just stared scanning them into our computer. Perhaps I'll share more another day! But for now, I'm off to eat cake! Winter Wonderland...Fa La La La La! My day started yesterday with a trip to the airport to pick up my best friend, Julie! She's here so we can celebrate our 5oth birthdays! We headed straight from the airport to a Starbucks to get some coffee and start catching up! From there, we headed back to my place to enjoy an afternoon of conversation while setting up my studio for Lowertown First Fridays. Julie was a great help turning my studio into a winter wonderland! She came up with the idea to hang the wreath on the dress form and prop one of my little paintings there. Doesn't it look cute? Notice the small ornaments, including mini-disco balls, hanging above the paintings?! Seriously, cute! And here I am below, with my dear friend ready for my open studio night! I am holding the incredible mixed media figure that Julie made for me! (I will share detailed photos soon) I am the proud and lucky owner of a Julie Branch original...I love this piece and it has jumped right on my short list of best presents ever...Check out more of Julie's work here! (And Julie is holding a wonderful book she got both of us...Hot Flash: A Celebration by Pamela Hastings. The book profiles/interviews a number on women artists...about aging/their art....I think it will provide much inspiration in the coming few years (it is available here). Perfect book for an artist turning 50! Oh, and Julie also gave me that incredible Pashmina shawl that I'm wearing...with all my colors...fuschia, turquoise, and purple! But I shared my night with good friends...and now I've shared my photos with all of you! I wish you could have all been here in person!!! 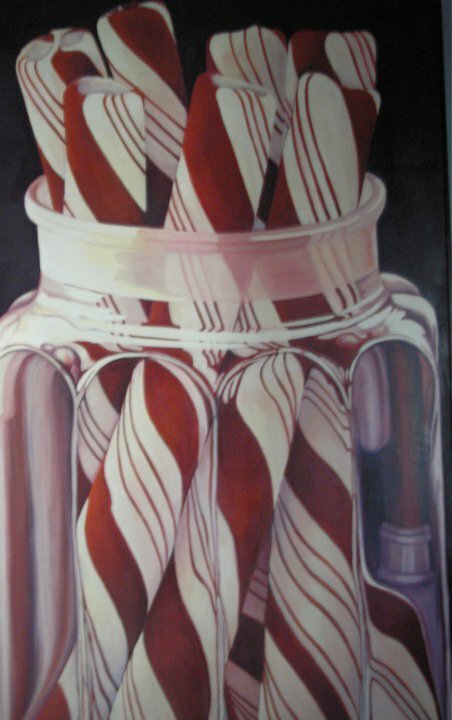 Lowertown First Fridays--It's an Holiday Art Extravaganza! It's a busy time of the year...people are trying to make the best use of their time...so when you can combine a fun, relaxing evening of music and art with the opportunity to do a little holiday shopping (for that unique, one of a kind gift that will be remembered! )...well, why not! 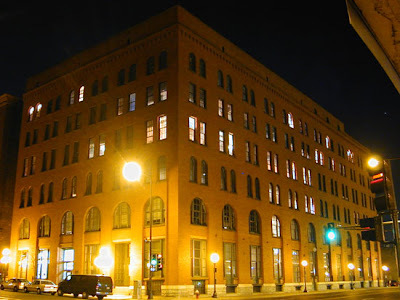 Lowertown First Fridays is just the ticket--and it's almost here! First, head to the second floor where you will find two fine artists open. In Studio 201, you will find the work of painter, Stephanie Guidera (work pictured above). Stephanie is frequently hard at work during LFF on her latest painting...stop by and you might just catch an artist in action! Down the hall in Studio 209, Jeff Hansen will be showcasing his remarkable nature photography (work pictured above). He does amazing work and will definitely have work for sale! Head up to the 5th Floor and you will find a number of open studios! Mason Weedman in Studio 505 will be showing how he builds and repairs fine instruments like cellos...and will have a cellist playing. Amelia Gluba in Studio 504 will be showing a number of paintings (such as above) and her mixed media sculptures...fun stuff! 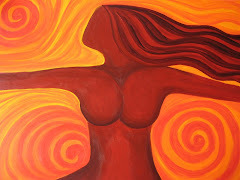 In Studio 501, Theresa Crushshon will be sharing her African American paintings. PJ, a jewelry artist, will be showing in the hallway and I will, of course, have my studio--#507 open. There will be lots of treats as well! Once you've checked out the Tilsner, I recommend you check out some of the other buildings as well. Many fine artists will be open over at the Jax, 253 E. 4th Street. This is where I have my working studio...it's just a short walk from the Tilsner. I encourage you to check out the work of painters Barbara Evan and T. Young (aka Tracy Olson), to name a few! Wrapping up the evening with a visit to the Northern Warehouse is always a good bet. The AZ gallery will be hosting an opening and the Black Dog will have lots of music. Don't forget to head upstairs to the open studios of resident artists such as Rhea Pappas and Kara Hendershot and many more!